World champions Spain took their place among the game's greats when they thrashed Italy 4-0 to become the first team to win successive European Championship titles on Sunday. Spain’s Jordi Alba celebrates after scoring the second goal during the final against Italy in Kiev on Sunday. The success of the Spanish national team is mainly down to the efficiency of its clubs' academies and the quality of coaching staff, coach Vicente del Bosque said. Del Bosque said the Iberian nation was experiencing "an incredible era" and was ready to become a leader in European football. UEFA president Michel Platini has said he was stressed out and tense in the build-up to Euro 2012 but that the tournament was so successful on and off the pitch it would leave the greatest legacy to European soccer. 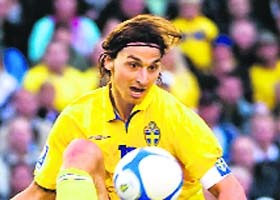 At Euro 2004, Greek newspaper Ta Nea ran a candid diary from defender Traianos Dellas - reviewing it is like tracking the birth, formation and realisation of a dream. His pre-tournament entries are circumspect, almost distancing himself from relaying coach Otto Rehhagel's belief that the squad was on the verge of greatness. Oliver Bierhoff owed his appearance in the final of Euro 1996 to Monika, wife of team coach Berti Vogts. Bierhoff scored two goals in the final. The last time Marin Cilic played on a main showcourt in London, he was roundly booed by a baying crowd and his moment of glory was hijacked. Luckily that experience last month will come in handy on Monday when the Croatian tries to ambush Andy Murray in the fourth round. Game, set and snatched! Rufus, the hawk who patrolled the skies to scare pigeons away at Wimbledon's has been stolen. The police said the American Harris hawk was taken together with its cage and handling glove overnight between Thursday and Friday from a car park in Wimbledon. Indian colts lost wickets in a heap towards the end of the innings as the U-19 Asia Cup final against Pakistan ended in a thrilling tie as both countries shared honours at the Kinrara Academy Oval here today. Chris Gayle slammed an unbeaten 85 and Kieron Pollard lashed 63 not out off 29 balls to set up a 56-run victory for the West Indies over New Zealand in the first of two Twenty20 international in Florida. Azhar Ali smashed 157 and Mohammad Hafeez narrowly missed a double century but wet weather dampened Pakistan's hopes of forcing a result over hosts Sri Lanka in the second Test today. Hafeez fell for 196 and Azhar equalled his highest score as the tourists moved from their overnight position of 334-1 to 488-4 on a rain-hit second day at the Sinhalese Sports Club. The Income Tax department has given a clean chit to the five banned domestic cricketers, who were involved in the IPL spot-fixing fiasco, from any financial misconduct or receiving kickbacks in order to fix matches. India overcame a defensive France 4-0 to make a clean sweep in the two-match friendly Test series here ahead of next month's London Olympics. Ace drag-flicker Sandeep Singh converted two penalty corners in each half for the Indians, while V R Raghunath and Danish Mujtaba were the other goal-getters for the visitors in Le Touquet yesterday, according to information received here. He was not quite sure if training abroad before Olympics would help much but after spending a fortnight preparing in Ireland, London-bound Vijender Singh today said the experience has done a world of good to the Indian boxers ahead of the mega-event this month. World champions Spain took their place among the game's greats when they thrashed Italy 4-0 to become the first team to win successive European Championship titles on Sunday. Goals from David Silva, Jordi Alba, Fernando Torres and Juan Mata gave the world champions an easy victory over an Italian team down to 10 men through injury for the last half-hour. The diminutive Silva scored with a rare header after a Cesc Fabregas pull-back in the 14th minute before a superb sprint finish from left-back Alba following a pinpoint Xavi pass doubled their lead four minutes before halftime. 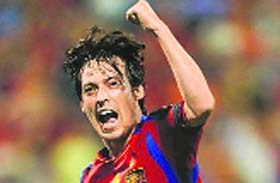 Torres, who scored the winner in the final when they won the title in 2008, struck their third goal in the 84th minute before setting up fellow substitute Mata to add the final flourish in the 88th. Italy had more possession than Spain in the opening half but when they did have a sniff of goal goalkeeper Iker Casillas maintained his astonishing record of not conceding a goal in the knockout stage of a tournament for the 10th successive match. Spain have become the first European side to win three major tournaments following their success in Euro 2008 and the World Cup two years ago. The only other team to win three successive major titles was Argentina who lifted the Copa America in 1945, 1946 and 1947 when that tournament was held annually. The third of them, Thiago Motta, only lasted four minutes after replacing Riccardo Montolivo in the 57th before limping off with a hamstring injury. Italy went close twice through second half substitute Antonio Di Natale but Mario Balotelli, the two-goal hero of their 2-1 semi-final win over Germany, rarely looked like scoring. The opening goal came when Andres Iniesta split the Italy defence with an incisive pass to Fabregas who outpaced Giorgio Chiellini to get to the byline where he pulled the ball back to Silva who flashed his header past the helpless Buffon. In the end, the game statistics were quite even, despite the unbalanced scoreline, which proves that Spain created goals out of nowhere. Spain had a 14-11 lead in shots at goal, and 6-4 lead in shots on target. They led 57%-43% on ball possession and 88%-83% on pass completion. These figures got skewed in Spain favour after Italy were reduced to 10 men. As Spain celebrated, there were tears and grief in the Italian team. Mario Balotelli and Leonardo Bonucci looked particularly distraught. Andrea Pirlo, the influential 33-year-old playmaker, has in all probably bowed out of major championship football and was suitably downcast. 1. Having the gall to softly chip a penalty over a diving 'keeper, rather than firing to his left or right, is such the height of cool that this technique is named after its pioneer, Antonin Panenka. He used it to win the 1976 European Championship for Czechoslovakia against West Germany in a penalty shootout. At Euro 2012, Andrea Pirlo did it in Italy's quarterfinal shootout victory over England, and Sergio Ramos performed a "panenka" to help defending champion Spain beat Portugal in their semifinal penalty shootout. Brave. 2. 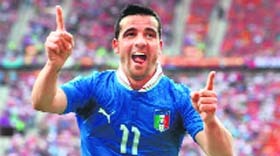 Italy was the only team that managed to score against the world and defending European champions at Euro 2012. Antonio Di Natale's chip at speed past Iker Casillas in the 61st minute in their opening Group C match on June 10 wasn't the prettiest goal of Euro 2012, but it's a top five pick for its rarity. 3. Controlling the ball 12 metres out, the nippy Spain midfielder faced a seemingly impenetrable wall of three Ireland defenders blocking his route to goal. So he improvised, dancing right then left before hitting the ball with pinpoint precision past one defender, through the legs of two others, and beyond 'keeper Shay Given. It was Spain's second goal in a 4-0 win Group C on June 14. Laser-like. 4. Sweden were already eliminated when they played France on June 19 in Group D, but their towering frontman was determined to go out with a bang. With a roundhouse kick Bruce Lee would have been proud of, Ibrahimovic met Sebastian Larsson's cross and threw himself nearly sideways in the air to volley the ball with his right boot past Hugo Lloris. Thumping. 5. The Manchester United forward scored only once for England at Euro 2012, but his goal was brilliant for its cunning and exquisite timing. With England and Sweden at 2-2 in the 78th minute of their June 15 group stage match, winger Theo Walcott sent in a cross. His back to the goal, Welbeck met the ball with his right leg and flicked it behind him with his heel, stunning Sweden goalkeeper Andreas Isaksson. 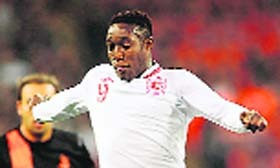 Welbeck's execution was astounding and the goal secured the win for England. "(Our success) is not a coincidence and has its foundations in many things, in the structure of our football, in the academies, and in better coaches," he said in an interview. "The (Spanish) clubs are devoting themselves to training youngsters, some kids leave for foreign teams at a very young age," he added. "Before we would travel abroad to look at the academies in France, Russia, Germany. Now many of these countries come to see what we are doing in Spain." 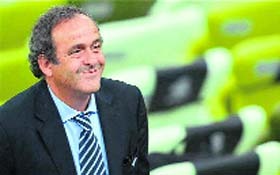 UEFA president Michel Platini has said he was stressed out and tense in the build-up to Euro 2012 but that the tournament was so successful on and off the pitch it would leave the greatest legacy to European soccer. Platini backed Ukraine and Poland's bid when they were chosen in April 2007 to co-host the event shortly after he became UEFA president. But the build-up to the tournament was a troubled one, blighted by spiralling costs, delays in both countries and political instability in Ukraine. He threatened several times to move the event from Ukraine, and opened up about his personal feelings on Saturday. "I was very tense, very stressed out, before this tournament. I came in very tired because I had a lot of pressure on my shoulders for the last four or five years to see if it would work," he said. "Today I'm more relaxed, calmer. We had criticism before the tournament and we needed to respond to it. That's why I was tired but now I'm less tense and can't wait for my holidays next week." Despite his initial fears and widespread scepticism that the two Eastern European countries could stage the event, he endorsed their efforts, praising everyone involved in its success. "Poland and Ukraine have organised a fantastic tournament which has been unique in its atmosphere,” he said. “More than 1.3 million people have gone to matches in the stadiums, which is a record, and the Euros will leave a very important legacy in these countries. Never before has a slogan been more true - 'lets create history together' - in terms of the economy, the infrastructure, in terms of football development, in terms of social development, and promoting these countries all over the world." "Rehhagel is speaking to us constantly, trying to convey the message that we are not going to Portugal as tourists, that this is our chance." Gradually, through flattery ("Rehhagel calls me the Colossus of Rhodes"), a commitment to metaphors that would make Shakespeare balk ("Rehhagel said, 'Once upon a time, a renowned world boxing champion was up against a modest rival…'") and impressive results, "he" became "we". Preparing for the final against the hosts, Dellas' words carried a distinctive cadence. "This team is like a cobra - it strikes once and it's over," the centre-back said. After victory he added, "When Angelos Charisteas scored, I was thinking just one thing: 'It's ours now'." Dellas' thoughts are resonant of other former EURO winners. They all had their own problems, their own crosses to bear, and their own methods of accepting or overcoming them. What unites the 13 teams, though, is a commitment to a driven coach, clear directions and a common destination. Iker Casillas recalls that four years ago the calm assurance of Luis Aragonés was infectious. "A month before the finals, the coach had everything sorted in his mind - how to manage the squad and precisely what he wanted from the tournament. It was key." Not that victorious managers are impervious to outside opinions and advice. One of the most important decisions Berti Vogts made amid Germany's run to EURO '96 glory happened aboard a gondola in Venice, as he ruminated loudly about who to select as his fourth striker. "Take Oliver Bierhoff," came the sagacious (perhaps bored) reply from his wife Monika, "he will repay you." Bierhoff came off the bench in the final and cancelled out the Czech Republic's lead before hitting a golden goal winner. The hunch - that certainty you cannot explain, cannot substantiate, cannot ignore. When Sandro Mazzola learned he had been left out of the 1968 final against Yugoslavia, he started packing his bags. It took teammates Tarcisio Burgnich and Giorgio Ferrini locking him in his room and a phone call to his wife to persuade him to stay. "I'm a Scorpio," he explained. "I have a peculiar character." He watched as Italy drew 1-1, meaning a replay 48 hours later. Coach Ferruggio Valcareggi was expected to ignore Mazzola after his outburst but instead drafted him into the side - the playmaker was pivotal as Italy won 2-0. As many important decisions are made off the pitch as on it. Whoever lifts the Henri Delaunay Cup in Kyiv will have spent over 40 days in the company of 22 other squad members plus the coaching staff. They will possibly play eight games, friendlies included - for the rest of the time they will be on a repetitive treadmill of hotel, training, team discussions and managing expectations. A five-star incarceration; largely confined to your cell, allowed out only for meals, time in the exercise yard or an all too familiar recreation room. How do you fill that time? As the likes of Dellas have shown, it can be used for personal endeavour, but mostly it is an opportunity to further bind the group; for inclusion rather than exclusion. Indeed, Dellas was an enthusiastic participant in Greece's backgammon tournaments. In 1992 Denmark bonded over clandestine (if coach-endorsed) trips to McDonald's, while Czechoslovakia warmed up for the 1976 showpiece with a trip to a cinema to watch a Western they barely understood. All rather tame compared to 1988 when captain Ruud Gullit dragged the Netherlands to a pre-final Whitney Houston concert. Casillas speaks more generally about Spain's 2008 base "being a place of great happiness". He adds: "There was this feeling that we were living through a wonderful period. We all got on excellently together and the squad was really happy with our coach." That man again. It seems the orchestra is only ever as good as the conductor. Spain's only previous EURO success, in 1964, was largely credited to boss José Villalonga, who ignored some big names to select a squad far stronger than the sum of its parts. Understandably, on the morning of the final against holders the Soviet Union, the nerves among his youthful players were palpable. They stalked their base at La Berzosa with the same haunted resignation as the game Franco used to hunt in its grounds. Villalonga announced they were going for a walk. Halting in the shade of an olive tree, he bent down and drew a pitch in the parched soil. The late Chus Pereda recalled: "He took some stones and said, 'These represent us while our opponents are these pine cones. What are stronger, stones or cones?" Mr Rehhagel, eat your heart out. 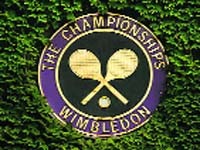 Since Rafa Nadal was sensationally turfed out of Wimbledon in the second round, expectations have been growing by the minute that fourth seed Murray will become the first British man since Bunny Austin in 1938 to reach the final. The Scot, though, is aware that what looks easy in print, with the Wimbledon programme showing he is the highest seed left in the bottom half of the draw, is unlikely to be as simple in reality as he has to navigate a number of minefields if he is cross the final border. If he gets there, Murray is likely to bump into either holder Novak Djokovic or six-times champion Roger Federer, so winning the title still seems like a long shot. Before he can even think about the possibility of challenging for the title, he has to overcome an opponent who is riding high on an eight-match winning streak on grass. 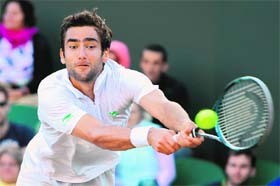 Both Cilic and Murray came dangerously close to not finishing their third-round matches on Saturday and they will be hoping their bodies do not let them down on Court One on Monday. While Cilic was lucky to complete a 7-6, 6-4, 6-7, 6-7, 17-15 victory over Sam Querrey in five hours 31 minutes as dusk fell over south-west London, Murray won his race against the clock to see off Marcos Baghdatis under floodlights at 2302 local time, the latest ever finish at Wimbledon. Murray has a 5-1 record against the big-serving, lanky Croatian, who will be boosted by his success at Queen's Club a fortnight ago. Game, set and snatched! Rufus, the hawk who patrolled the skies to scare pigeons away at Wimbledon's has been stolen. The police said the American Harris hawk was taken together with its cage and handling glove overnight between Thursday and Friday from a car park in Wimbledon. Officers said Rufus was a family pet and described his owners as very "distressed" over the theft. The police said the working bird of prey deters pigeons by its presence at the All England Lawn Tennis Club.For the past four years, the hawk has spent every morning of the Championships scaring pigeons away from the hallowed grass. A spokesman said that one of Rufus's "pals", Hector, had been drafted in so there was no increased risk of pigeons becoming a nuisance on Centre Court. Avian celebrity Rufus is something of a Wimbledon fixture with his own Facebook page and Twitter account with 257 followers, the BBC reported. 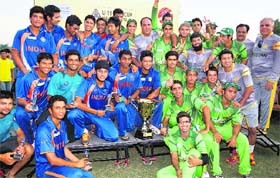 Indian colts lost wickets in a heap towards the end of the innings as the U-19 Asia Cup final against Pakistan ended in a thrilling tie as both countries shared honours at the Kinrara Academy Oval here today. While Pakistan scored 282 for nine off 50 overs, India could only level scores losing eight wickets when the proceedings ended. Required to get seven off the last over, India lost skipper Unmukt Chand (121) in the fourth ball before Rush Kalaria slammed Ehsan Adil through the off side for a four to level the scores. The right-hander, however, failed to score of the last ball of the match as he chipped it straight to the mid-off, much to the dismay of the 2000 odd people present at the ground. Chasing a victory target of 282, India started off sedately losing opener Manan Vohra in the fifth over before Chand and Baba Aparajith combined together to put their team into the drivers seat. The duo amassed 175 runs for the second wicket, with Aparajith leading the run chase with a strokeful 90 off just 86 balls before being dismissed by Mohammad Nawaz in the 37th over of the match. Chand on the other side encashed his rich form to compile a yet another century to keep India in the hunt until he hit a short pitched delivery from Adil straight to the cover boundary in the final over of the day. Vijay Zol, who followed Aparajith to the crease, could not contribute much with the bat as he fell to Zia-ul-Haq after adding just 11 to the Indian total. Akshdeep Nath (23) in association with skipper Chand took India closer to the target, summing 33 runs for the fourth wicket, but his dismissal in the 45th over opened the floodgates as the team lost five wickets for just 35 runs to finish the match at 282 for eight. For Pakistan, Adil and Nawaz took three wickets apiece to halt the rampaging Indian side. Earlier, Pakistan rode on a strokefull 134 of just 124 balls from opener Sami Aslam to pile up challenging total on the board. Aslam was helped by Umar Waheed (48) to take Pakistan to stability after they lost skipper Babar Azam and Imam-ul-Haq at a score of 62. Aslam and Waheed added 100 runs for the third wicked before Vikas Mishra got better off the later in the 32nd over of the match. Sandeep Sharma then castled Mohammad Nawaz on 13 before left-armer Kalaria returned to pick five wickets in the death overs to restrict Pakistan to 282 for nine at the end of their innings. Gayle smashed seven fours and five sixes off 52 balls to anchor a record-breaking West Indian total of 209-2 off 20 overs yesterday. The equally powerful Pollard lofted five fours and five sixes as the pair shared a partnership of 108 off 47 balls. New Zealand was briefly up with the demanding required rate but eventually was bowled out for 153 off 18.3 overs at Central Broward Regiona Park. West Indies spinner Sunil Narine claimed 3-34 while there was a wicket apiece for captain Darren Sammy, Fidel Edwards and Dwayne Bravo. Earlier, Dwayne Smith started the six-hitting frenzy after New Zealand had sent in the West Indies, smashing two in scoring 17 off 13 deliveries before he was bowled by paceman Doug Bracewell to make it 27-1. Gayle and Johnson Charles (24) put on a stand of 74 before Charles top-edged Kane Williamson to backward point. Gayle reached his half-century in 42 balls in the 16th over, while Pollard was even more rapid, his milestone taking just 24 deliveries. 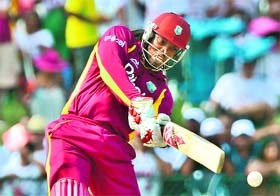 Gayle lashed Bracewell for four sixes in one over toward the end as West Indies reached their highest Twenty20 total. New Zealand's reply was led by opener Rob Nicol, who struck five fours in 32 off 33 balls. He and Martin Guptill shared an opening stand of 38 in four overs before Narine broke through with his first delivery, having Guptill stumped down the leg side off a wide. 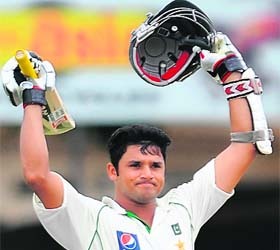 Azhar Ali smashed 157 and Mohammad Hafeez narrowly missed a double century but wet weather dampened Pakistan's hopes of forcing a result over hosts Sri Lanka in the second Test today. Hafeez fell for 196 and Azhar equalled his highest score as the tourists moved from their overnight position of 334-1 to 488-4 on a rain-hit second day at the Sinhalese Sports Club. Heavy showers on either side of lunch and just before tea allowed just 44 overs to be bowled in the day, in which Pakistan scored 154 runs. The entire evening session was washed out, and with more rain forecast over the next three days, Pakistan face a tough task to level the three-match series after losing the first Test in Galle by 209 runs. Azhar, who put on 287 for the second wicket with Hafeez, added 70 for the third with Younis Khan (32) and 51 for the fourth with skipper Misbah-ul Haq (29 not out). The department, which conducted an investigation into the financial transactions of the five players for charges of spot-fixing, found that the cricketers have not received any pecuniary benefit in cash or by the way of fund deposits in their accounts. The five players-T P Sudhindra, Shalabh Srivastava, Mohnish Mishra, Amit Yadav and Abhinav Bali were also questioned by the I-T sleuths at their special unit office in the national capital after a TV channel aired the sting operation. According to sources privy to the development, the department is expected to submit a report in this regard soon and would also inform the Sports Ministry. The I-T sleuths also conducted a scan on the bank accounts, investments and other financial avenues of these five cricketers and their close relatives, in order to probe if any kickbacks were illegally received by them to fix IPL matches. India had earlier defeated France 8-2 in the series opener in Ville. With France opting to play all 11 men behind its 25-yard line for much of the time, it was a different experience for the Indian team than usual. The team coped well with the challenge, creating more circle penetrations than the home side. Also, the Indians got used to the blue turf which, despite being in use for a while now, was on the bouncier side. Though France packed its defence, the Indian attack created opportunities that led to Raghunath's opening goal from a penalty corner strike. Sandeep then scoring a penalty corner goal in each half before Danish deflecting a cross late in the second half to round off the tally. India rested skipper Bharat Chetri, forward Shivendra Singh and rookies Nitin and Somanna. Indian chief coach Michael Nobbs fielded a different combination upfront — SV Sunil, Tushar Khandker and Birendra Lakra — than in the first game. The team will have a rest day before travelling to the Spanish city of Santander tomorrow. 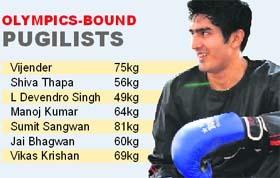 An unprecedented seven Indian male boxers would be participating in the Olympics in London and six of them were in Dublin for a fortnight last month to train for the Games. Vijender (75kg), Shiva Thapa (56kg), L Devendro Singh (49kg), Manoj Kumar (64kg), Sumit Sangwan (81kg) and Jai Bhagwan (60kg) were the ones who trained in Dublin under the watchful eyes of national coach Gurbax Singh Sandhu, while Vikas Krishan (69kg) stayed back to give his college exams. Vijender said he was sceptical about going abroad with just a few weeks left for the Olympics but has come back more assured of his preparations for London. "I was not sure how it would help us, I thought training in Patiala would be better. But after going there, I realised how much difference it could make to our preparations," Vijender told PTI after returning to the country today. "It made a huge difference as we got acclimatised to European conditions. It is biting cold there and extreme heat here. So, now when we go to London, we won't exactly be shocked by the weather. It would be easy to adapt," he said. The Indian boxers are in the country for just 10 days before they pack off for London, where they will train before heading to the Games Village in the last week of the month for the July 17 to August 12 event. "We followed an exhausting training schedule in Dublin. It was perfect to put us into rhythm for London. We used to train twice a day in Dublin. In the morning, we practiced among ourselves while in the evening we used to spar with other teams which had come there," Vijender explained. The Beijing bronze-medallist, who also bagged a bronze at the World Championships in 2009, will be joined by the young brigade of teens such as Shiva and Devendro, in London and they also claimed to have gained from the trip to Dublin.